Iranian protesters are angry at the high cost of basic goods. The price of eggs, for example, has gone up 40 percent in just six months. Some Iranians say it's time for the government to focus on domestic issues, and to forget Syria, and forget Palestine. 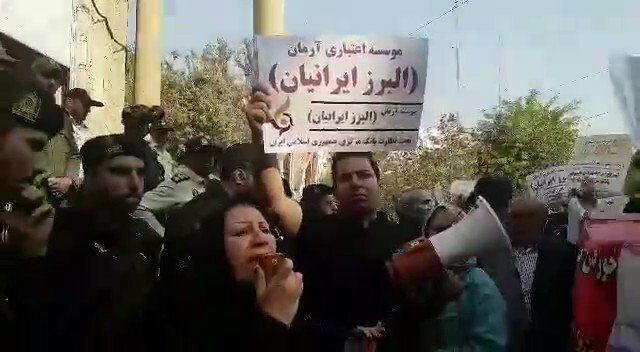 December 30, 2017 "Information Clearing House" - Yesterday and today saw some small protests in Iran. They are probably the first stage of a large "regime change" operation run by the U.S. and Israel with the help of Iranian terrorist group. A delegation led by Israel's National Security Adviser met with senior American officials in the White House earlier this month for a joint discussion on strategy to counter Iran's aggression in the Middle East, a senior U.S. official confirmed to Haaretz. "[T]he U.S. and Israel see eye to eye the different developments in the region and especially those that are connected to Iran. We reached at understandings regarding the strategy and the policy needed to counter Iran. Our understandings deal with the overall strategy but also with concrete goals, way of action and the means which need to be used to get obtain those goals." Hundreds took to the streets of Iran’s second largest city of Mashad on Thursday to protest over high prices, shouting slogans against the government. Videos posted on social media showed demonstrators in Mashad in northwest Iran, one of the holiest places in Shia Islam, chanting “death to (President Hassan) Rouhani” and “death to the dictator”. The semi-official ILNA news agency and social media reported demonstrations in other cities in Razavi Khorasan Province, including Neyshabour and Kashmar. A video of that protest in Mashad showed some 50 people chanting slogans with more bystander just milling around. Iran’s Supreme Leader Ayatollah Ali Khamenei, who has repeatedly criticized the government’s economic record, said on Wednesday that the nation was struggling with “high prices, inflation and recession”, and asked officials to resolve the problems with determination. On Thursday and today the slogans of some protesters turned the call for economic relief into a call for regime change. My hunch is that the usual suspects are behind these protests. Note that these started in several cities at the same time. This was not some spontaneous local uproar in one city but had some form of coordination.  Reports of signals of international satellite TV networks jammed in large cities of Iran. Would be sign of regime fear of today’s protests spreading. A search in various languages finds exactly zero such "reports". Carl Bildt is a former Swedish prime minister. He was recruited in 1973 as a CIA informant and has since grown into a full blown U.S. asset. He was involved in the Ukraine coup and tried to personally profit from it. The only response to Bildt's tweet was from one Riyad Swed‏ - @SwedRiyad who posted several videos of protests with one of them showing burning police cars. I am not sure the video is genuine. The account has some unusual attributes (active since September 2016, 655 tweets but only 32 followers?). Just yesterday one lecture at the CCC "hacker" congress was about the British GHCQ Secret Service and its sock-puppet accounts on Twitter and Facebook. These are used for acquiring human intelligence and for running "regime change" operations. Page 14-18 of the slides (11:20 min) cite from obtained GCHQ papers which lists Iran as one of the targets. The speaker specifically notes a GCHQ account "@2009Iranfree" which was used in generating the protests in Iran after the reelection of then President Ahmedinejad. About 300 demonstrators gathered in Kermanshah after what Fars called a “call by the anti-revolution”and shouted “Political prisoners should be freed” and “Freedom or death”, while destroying some public property. Fars did not name any opposition groups. 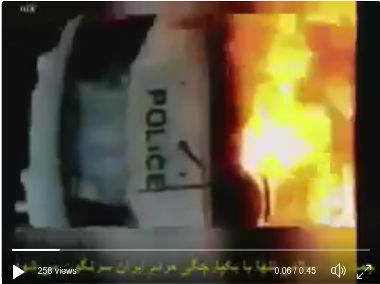 Footage, which could not be verified, showed protests in other cities including Sari and Rasht in the north, Qom south of Tehran, and Hamadan in the west. 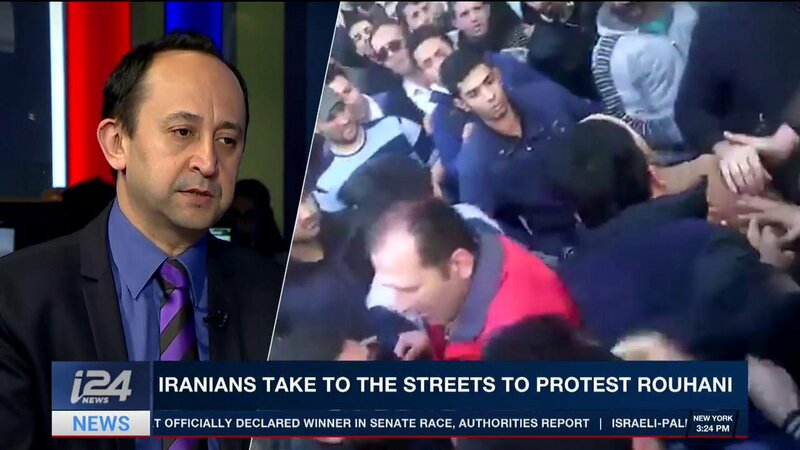 Mohsen Nasj Hamadani, deputy security chief in Tehran province, said about 50 people had rallied in a Tehran square and most left after being asked by police, but a few who refused were “temporarily detained”, the ILNA news agency reported. In the central city of Isfahan, a resident said protesters joined a rally held by factory workers demanding back wages. “The slogans quickly changed from the economy to those against (President Hassan) Rouhani and the Supreme Leader (Ayatollah Ali Khamenei),” the resident said by telephone. Purely political protests are rare in Iran [...] but demonstrations are often held by workers over layoffs or non-payment of salaries and people who hold deposits in non-regulated, bankrupt financial institutions. Alamolhoda, the representative of Ayatollah Khamenei in northeastern Mashhad, said a few people had taken advantage of Thursday’s protests against rising prices to chant slogans against Iran’s role in regional conflicts. “Some people had came to express their demands, but suddenly, in a crowd of hundreds, a small group that did not exceed 50 shouted deviant and horrendous slogans such as ‘Let go of Palestine’, ‘Not Gaza, not Lebanon, I’d give my life (only) for Iran’,” Alamolhoda said. Two videos posted by BBC Persian and others I have seen show only small active protest groups with a dozen or so people while many more are just standing by or film the people who are chanting slogans. Mrs. Maryam Rajavi, President-elect of the Iranian Resistance, saluted the heroic people of Kermanshah and other cities who rose up today chanting “death or freedom”, “death to Rouhani”, “death to the dictator”, and “political prisoners must be freed”, and protested against high prices, poverty and corruption. She said, “Yesterday Mashhad, today Kermanshah, and tomorrow throughout Iran; this uprising has tolled the death knell for the overthrow of the totally corrupt dictatorship of the mullahs, and is the rise of democracy, justice and popular sovereignty. This very early engagement of the MEK -its first report was published yesterday at 10:26 am- is extremely suspicious. On Thursday, U.S. officials speaking to NBC news claimed that Mossad agents were training members of the dissident terror group People’s Mujahedin of Iran in order assassinate Iranian nuclear scientists, adding that the administration of U.S. President Barack Obama was aware of the operation, but had no direct link to them. In this approach, the United States would pressure the Iranian regime and simultaneously back groups that oppose it-whether the exiled extremist National Council of Resistance of Iran (NCRI), pro-democracy Green Revolution factions, or ethnic minorities within Iran-a strategy advocates often compare to Reagan’s support for civil society groups in the Soviet Union. [A] proponent of “coerced democratization,” the Foundation for Defense of Democracies’ Mark Dubowitz, urged President Trump to “go on the offensive against the Iranian regime” by “weakening the Iranian regime’s finances” through “massive economic sanctions,” while also “undermin[ing] Iran’s rulers by strengthening pro-democracy forces” inside Iran. This option appears to be gaining traction in the Trump administration’s ongoing Iran policy review and has received public support from Tillerson. CIA Director Mike Pompeo also favored such an approach during his time in Congress. The MEK/NCRI noted that Senator Tom Cotton, who will likely replace CIA chief Pompeo when Pompeo moves to the State Department, issued a supportive statement for the protests. The White House and the Netanyahoo regime agreed on a strategy towards Iran. Major members of the Trump administration are in favor of "regime change" by "pro-democracy forces" in Iran. A few weeks after an agreement was found, coordinated economic protests start in Iran which are soon hijacked by small groups of very active regime changers. A group of Iranian exile terrorists, well known for deadly collaboration with Israeli spies as well as for having operation cells in Iran, is highly engaged in the protest from very early on. If this the "regime change" operation I presume, the protests will soon get bigger. When the people need money a few thousand dollars are enough to create a large crowd. Small groups will riot while hiding within the larger protests of maybe genuinely concerned people. The "western" media will engage with their usual pseudo liberal humanism and concern trolling. When the police in Iran tries to arrest those rioters who are raising havoc the media will scream "brutality". Some "martyr" will be created and iconified. Rumors of censorship and suppression will be raised (see Carl Bildt above), fake news will come from everywhere and hundreds of sock puppet Twitter and Facebook accounts will suddenly be "Iranian" and breathlessly report "from the scene" of their Langley offices. For the Iranian politicians and police the issue is tricky. Economic protests are clearly justified with even Khameni voicing support for the issue. But rioting in the streets must be suppressed before it further escalates and becomes uncontrollable. Weapons on the protesters site firing in all directions may soon become a problem. The Mossad and the MEK are not shy of killing random people. But the Islamic Republic in Iran has genuine support in large parts of the society. There are big civil organizations that support the government - not on every issue but in its general framework. Most Iranian's are proud nationalists and will be difficult to divide. If this is indeed the "regime change" attempt I suspect, I predict that it will fail. US State Department hints at Iran overthrow. 2018 may bring in the most ambitious, dangerous, and destructive US regime change operation yet…and that says a lot considering previous US regime change operations of the past; Iraq, Libya, Ukraine, Syria…not to mention Yugoslavia, Somalia, the Arab Spring, Yemen, and on and on. Trump is setting his sights on the big regime change prize, Iran. The Duran has noted in many previous articles that it appears POTUS Trump has come to an agreement with the Deep State…American internal policy victories (like the recent tax plan) for foreign policy, MIC – Deep State carte blanche. Collapsing of #Islamic_Republic has begun. Tehran, Kermanshah and Mashhad. Protests are even taking place in the holy city of Qom. Meanwhile, as Zerohedge reports, the US State Department has issued a formal condemnation of the Iranian government following two days of economic protests centering in a handful of cities, calling the regime “a rogue state whose chief exports are violence, bloodshed, and chaos” while announcing support for protesters. It fits a familiar script which seems to roll out when anyone protests for any reason in a country considered an enemy of the United States (whether over economic grievances or full on calling for government overthrow). On June 14, 2017, Secretary Tillerson testified to Congress that he supports “those elements inside of Iran that would lead to a peaceful transition of government. Those elements are there, certainly as we know.” The Secretary today repeats his deep support for the Iranian people. Reports of peaceful protests by Iranian citizens fed up with the regime’s corruption and its squandering of the nation’s wealth to fund terrorism abroad. The Iranian government should respect their people’s rights including their right to express themselves. The world is watching. As we noted during our initial coverage of Thursday’s protests, Israeli as well as Iranian opposition media commentators (and of course pundits in the US mainstream) have generally appeared giddy with excitement at the prospect that protests could spread inside Iran, potentially culminating in society-wide resistance and possible change in government. It goes without saying that Iran has been enemy #1 for the United States and Israel since the Islamic Revolution and embassy hostage crisis beginning in 1979. 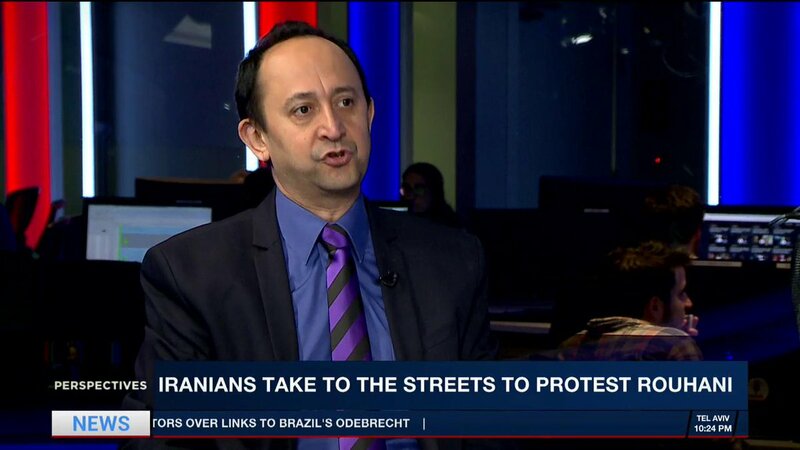 Pro regime-change “experts” brought in to discuss the protests on various media panels are eager to brand this another democracy, human rights “revolution”, with Saudi royal family owned Al-Arabiya presenting the Iran protests in terms of women’s rights. As with Syria and Libya before it, we are obviously witnessing regime change agents hijacking economic protests. Advice for #Iranprotests, if you really want to change things -- I mean the regime: Focus on Tehran. Treat the front-line police and army conscripts with respect and humanity -- try to bring them onside. Take over broadcast stations. #iranprotests are very different than 1999 and 2009 protests. This is the most vehemently anti regime event I've ever seen. Not just about the economic situation, but a deep and desperate cry against an unjust and repressive system.